By LUDWIG VON KOOPA - Nintendo, you've deteriorating here. "And that's how they hook you into starting micro-transactions. Yeah, that's right. Nintendo's "mobile strategy" is helping mobile companies sell things and then not actually getting royalties if consumers buy the "free" version. Wonderful strategy, right?" You can think of my mutterings as incoherent out-of-context, but consider the way Pokémon Shuffle is set up. Now Nintendo is entering the mobile space with a partnership with DeNA Co., Ltd. But that partnership isn't the only thing Nintendo is doing in mobile — there is an independent effort with... Pokémon Shuffle Mobile! Well, it's not just Nintendo, but also The Pokémon Company International. And TPCi has been doing mobile trash for a while, but this time it's different. This is the first time they take a game on the 3DS and actually port it to mobile. Everything before was original. Big text: "Free Download Available Now!" Tiny text I have to make the picture really large so you can see it: "In-game purchases are available." 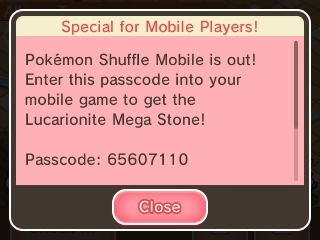 Pokémon Shuffle Mobile is out!" I took that screenshot from within my own game of Pokémon Shuffle. I've managed to get off playing it every day. It's hard to do because there's perceived economic value being lost when you don't play constantly and use your free regenerative hearts, but I'm doing it. So one of the times I AM playing Pokémon Shuffle this week I get this message in-game. Basically, they're advertising the mobile version to owners of the 3DS version. They are LITERALLY asking people who already have the game on 3DS to instead play the mobile version. So people play their 3DS less and their mobile garbage device more. This is a game that got advertisement through Nintendo's push notification system. So every Nintendo 3DS owner with SpotPass enabled got advertised this game, and everyone who followed through and got it are now being told to get its mobile version and presumably play that instead. It's shameful and disgusting, and Nintendo is killing their own system. ...On the other hand, maybe it means that Nintendo will just move all of this recently-brought-in mobile-esque garbage into actual mobile. And that'll leave the 3DS for the traditional purchase models we're used to. Ludwig wished that his Nintendo 3DS didn't have broken shoulder buttons so he could play a wider variety of games on it. Follow him at NNID Miiverse, where he'll never post in the Pokémon Shuffle community out of embarrassment. He thanks the Miiverse Redesign's Screenshot Album for making this article possible. Push notifications are being used not only to kill the 3DS, but to advertise free-to-play games with total lies in the ad copy. I never had any motivation to download this on my 3DS. Only downloaded Rusty's Real Deal Baseball for Club Nintendo points then deleted it. As an FYI, Girafarig was an event-only Pokémon. So that means you could only get it when they feel like re-running that event, as opposed to having it in the linear main mode that you can replay however many times you want (as long as you have enough wait-to-play hearts). But yeah it's better off if you never download this to begin with. I am surprised Girafarig is in that game, I am used to Girafarig not being in most spinoffs *glares at Conquest, Pokemon Mystery Dungeon: Gates to Infinity*. That's what I get for being a fan of the real life animal who barely stars in nature shows except as a background animal that happens to be in the camera or it is in a nature show with a mixture of animals even though some of those animals have far more screen time than others. Why would a fictional depiction of the animal be treated any better? Though it is nice to have a giraffe be a unique NPC in Animal Crossing and of course be the mascot of Toys R' Us. There's Girafarig. In terms of power, it's outclassed, but its ability is relatively unique. Not sure if it's any good I've never touched it and I'm not good at Shuffle. ...I've never used a Girafarig in any game, actually. The 3DS is on its way out in the next two years, so I'm not surprised that they are porting lesser, hold over games to the mobile market. Two years is a long time from now in the videogame industry. That's two Call of Duty games! 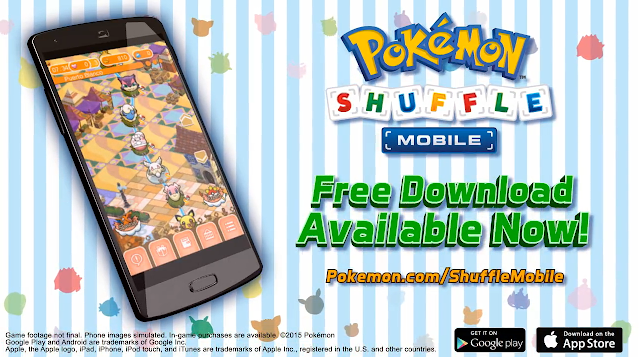 I'm not surprised that they've ported Shuffle to mobile because it literally is a mobile game in behaviour. I'm surprised they're not only trying to port the game, but they're trying to port the players.